But surely the strangest form of government intervention is taking place in Japan, where the Bank of Japan has embarked on an aggressive program of buying, not just Japanese government bonds, but also stocks. Having a buyer the size of Godzilla stomping into the equities market is bound to add to the demand side of the market, which will tend to raise stock prices. Indeed, the Japanese Topix Index—the broadest measure of Japanese stocks—has risen from 1500 in May to 1813 recently. The year-to-date return is a robust 19.78%. The Bank of Japan’s aggressive buying up of Japanese government bonds has led to one of the more interesting anomalies in the global financial scene: bonds are now routinely issued at negative interest rates, meaning the Bank of Japan and other buyers are guaranteed to lose money when they buy the bonds. 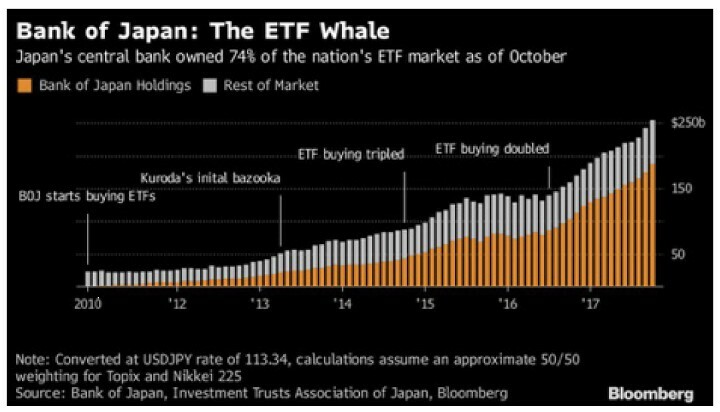 In the stock market, the situation may not yet be quite as disruptive, since Japanese ETFs are not as dominant as they are in the U.S. The Bank of Japan holdings currently amount to just over 5% of Japan’s Topix index stock market capitalization. But nobody knows what will happen when (and it is not “if” but “when”) the central bank has to start selling off its positions. The bull market that Japanese investors have enjoyed this year may not be sustainable on the metric merits, and it could turn around fast if Godzilla decides to stomp in the opposite direction.